DA Form 67-10-2 also known as the Field Grade Plate (O4-O5; CW3-CW5) Officer Evaluation Report is a document used for providing Department of Army Headquarters (HQDA) with information about the rated officers' competence, mental and physical condition and potential for promotion. This form was previously revised by the Department of the Army (DA) in November 2015 with all previous editions being obsolete. An up-to-date fillable DA Form 67-10-1 is available for download below. The DA 67-10-2 is used to assess the performance of officers ranked major (MAJ) through lieutenant colonel (LTC) and chief warrant officer three (CW3) through chief warrant officer five (CW5). What Is DA Form 67-10-2? Starting on April 1, 2014, the U.S. Army introduced a new system of officer evaluation reporting to a new format to analyze and rate officer performance with regards to their rank. The DA 67-10-2 - along with the whole DA 67-10 series - replaced the outdated DA 67-9 series, which used a universal rating form for all Army officer ranks. The form - sometimes referred to as the DA Form 67 for short - should not be confused with the DD Form 67, Form Processing Action Request. 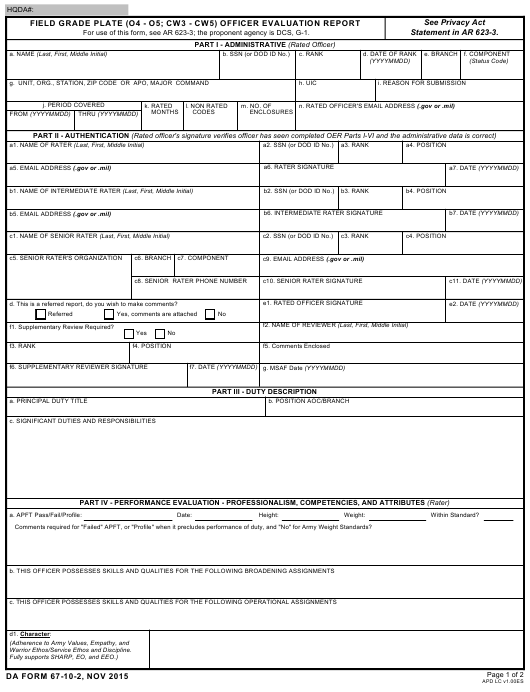 This form is used to request a cancellation or revision of an existing Department of Defense (DoD) form or to add a new one to the DoD inventory. The report is prepared by the rating chain, which includes the rater and the senior rater, sometimes, if needed, an intermediate rater takes part in the evaluation. The process includes supervision, a written self-assessment, a performance assessment, and a face-to-face discussion. The report will be forwarded to the Department of Army Headquarters (HQDA). During the preparation of the report, a supporting DA 67-10-1A Form is used. The rated officer has to fill it out with a description of their duties and a self-assessment of six criteria. The officer evaluation report support form will not be forwarded to HQ since it is used only as a medium in the preparation of the officer evaluation report. d2. Provide narrative comments which demonstrate performance regarding field grade competencies and attributes in the Rated Officer’s current duty position. (i.e. Part I is for providing administrative data about the rated officer, unit data, the number of months rated, non-rated time codes and the reason for submitting of the FGP-OER (Field Grade Plate Officer Evaluation Report). Part II is for authentication by the rated officer and rating officials and is filed at the end of the rating period when the report has been completed in full. The officer evaluation report cannot be forwarded to HQDA until the THRU date listed on the form. Part III provides a duty description of the rated officer. Part IV assesses overall performance, professionalism, and adherence to the Army's core leader competencies. Part V is filed only in an intermediate rater is participating in the evaluation process. Part VI includes an assessment of the rated officer's potential by a senior rater. DA Form 67-10-1 or the Company Grade Plate (O1 - O3; WO1 - CW2) Officer Evaluation Report is a report form closely related to the DA 67-10-2. The form is used when evaluating officers ranked first and second lieutenant, captains, warrant officers one and chief warrant officers two. DA Form 67-10-1A or the Officer Evaluation Report Support Form is a form used as a medium for the report by the rating chain. The supporting form allows the rated officer to evaluate themselves. The raters give feedback and set personal goals to improve future performance. The rated officer will receive a copy of this form at the beginning of the rating period and submit it before face-to-face discussions. DA Form 67-10-3 or the Strategic Grade Plate (O6) Officer Evaluation Report is another evaluation report used only when evaluating colonels. DA Form 67-10-4 (Strategic Grade Plate General Officer Report) is another report form used only when evaluating a Brigadier General - "General" for short - or higher.